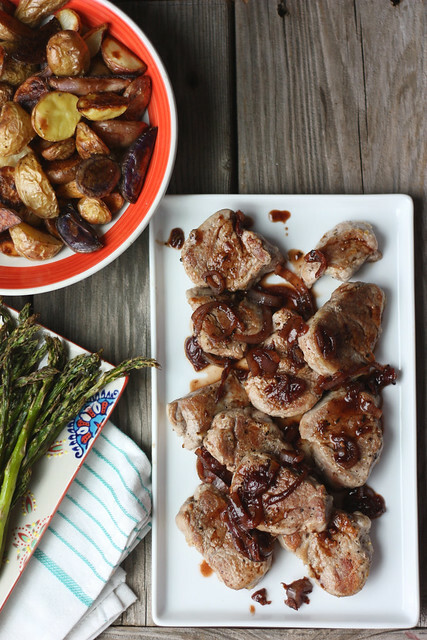 Pork Medallions with Red Wine-Cherry Sauce – Elly Says Opa! This is one of those meals that fires on every level: it’s quick, it’s incredibly easy, it’s healthy, and it tastes good. Oh and it even looks sort of fancy, so it’s great for guests, too. We’ve made this a few times now and it’s one of the few protein options that my kids don’t complain about (sorry we can’t eat steak or tacos every day, kids!). They aren’t huge on “normal” pork tenderloin but of course a sauce with cherry preserves is right up their sweet-toothed alley. Although I have not done this in the recipe below, I would recommend increasing the amount of sauce by a bit (especially because most tenderloins do seem to be a little closer to 1.25 lbs. or so than 1 lb.). I gravitate toward roasted fingerlings and some sort of green veg for this dish, but a parmesan orzo or a salad with goat cheese would be great options, too. Heat a large skillet over medium-high, and then add the oil. Season the pork medallions with salt and pepper and add them to the pan, cooking for about 2 minutes per side. Remove and keep warm. Saute the shallot with 2 teaspoons of the thyme until the shallot is softened. Increase the heat to high and add the wine. Cook for about two minutes, or until wine is nearly evaporated, scraping to loosen up any browned bits. Add the broth and cherry preserves. Cook about 8 minutes or until reduced to 1/2 cup, stirring occasionally. Season to taste. Spoon the cherry mixture over the pork and sprinkle with the remaining teaspoon of thyme.